Wicker Basket containing 5 felt dryer balls and a laundry pet knit and stuffed with 100% alpaca from our farm. no chemicals used in preparation. Saves 1/3 Dryer time and expense! 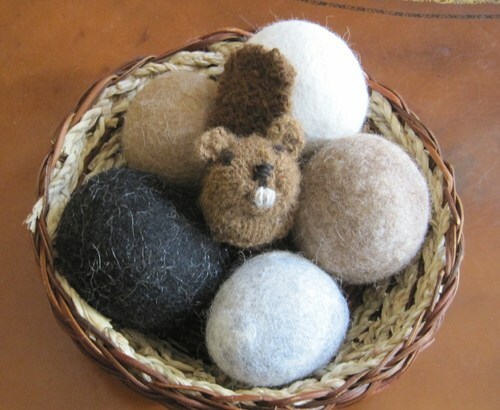 Woven basket containing 5 dryer balls in assorted colors and sizes with the resident critter, in this instance, a curious little beaver. Stop buying dryer sheets and use environmentally friendly alpaca fiber felted balls to keep your laundry moving freely in the dryer, wicking moisture away from your clothers and keeping the dryer uniformly moist. Reduces drying time by 1/3, saving you time and money on your electric bill. For fresh scented laundry, add 2 drops of your favorite essential oil to each ball. Alpaca felt balls are very long lasting, all natural, safe for children and pets. Use 3 to 5 in the dryer.